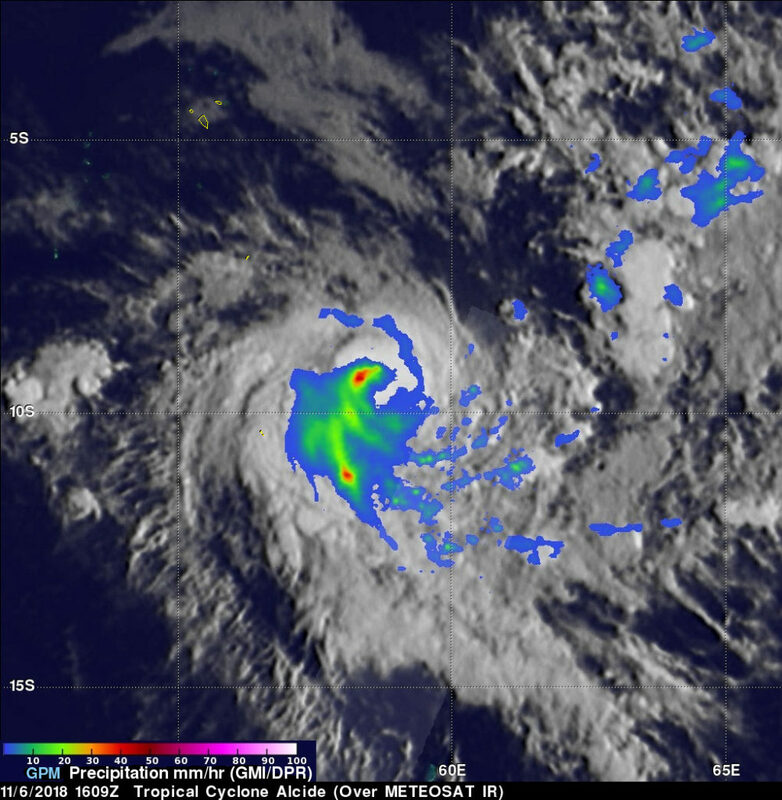 Tropical Cyclone Alcide dissipated over the weekend of Nov. 11 and 12 in the Southern Indian Ocean. However, when it was near peak intensity, the Global Precipitation Measurement mission or GPM core satellite provided a look at the rain falling within. The GPM core observatory satellite, a joint mission between NASA and the Japan Aerospace Exploration Agency, JAXA, had an excellent view of tropical cyclone Alcide on November 8, 2018 at 10:59 a.m. EDT (1559 UTC) after it had moved to a location northeast of Madagascar. At that time Alcide had reached its peak intensity with winds of about 95 knots (109 mph) making it the equivalent of a strong category two hurricane on the Saffir-Simpson hurricane wind scale. Data collected by GPM’s Microwave Imager (GMI) and GPM’s Dual-Frequency Precipitation Radar (DPR) instruments revealed that the powerful tropical cyclone was producing extremely heavy rainfall. GPM’s radar (DPR Ku Band) indicated that tall convective storms in the northwestern side of Alcide’s eyewall were dropping rain at a rate of more than 255 mm (10 inches) per hour. GPM’s radar data (DPR Ku Band) were used to create an image to probe the 3D structure of precipitation within tropical cyclone Alcide. The well-defined eye of the powerful tropical cyclone is revealed with this simulated view from the southwest. GPM’s DPR found that the most powerful convective storms were located in tropical cyclone Alcide’s western eye wall. A few of these tall storms were found by GPM to reach heights above 16.0 km (9.92 miles). On Nov. 11, Tropical cyclone Alcide dissipated near 12.3 south latitude and 51.9 east longitude, about 529 miles north-northwest of St Denis, La Reunion. Tropical Cyclone Alcide continued to linger just northeast of the Island nation of Madagascar in the Southern Indian Ocean when NASA’s Aqua satellite passed overhead and captured an image of the storm. On Nov. 9 the Moderate Resolution Imaging Spectroradiometer or MODIS instrument aboard NASA’s Aqua satellite provided a visible light image of the storm. The MODIS image showed a somewhat elongated storm from northwest to southeast with the bulk of clouds in the western quadrant of the storm. On Nov. 9, the Joint Typhoon Warning Center or JTWC noted that animated multispectral satellite imagery showed that Alcide has lost much of its deep convection (rising air that forms the thunderstorms that make up a tropical cyclone) but maintained its spiral banding, and convection is newly flaring over the low level circulation center. On Nov. 9 at 10 a.m. EST (1500 UTC), Alcide’s maximum sustained winds had dropped to 80 mph (70 knots/129.6 kph). It was located approximately 487 nautical miles north-northwest of Port Louis, Mauritius. Alcide is moving southward at 1.1 mph (1 knot1.8 kph) and is expected to curve to the northwest. Because of the storm’s slow movement, it is bringing up cooler waters from below the ocean’s surface, which will in turn, weaken the storm. The Joint Typhoon Warning Center now expects Alcide to move to the northwest and pass just north of the northern point of Madagascar over the next several days. The Global Precipitation Measurement mission or GPM core satellite passed over the Southern Indian Ocean and analyzed the rainfall occurring in pre-season Tropical Cyclone Alcide. 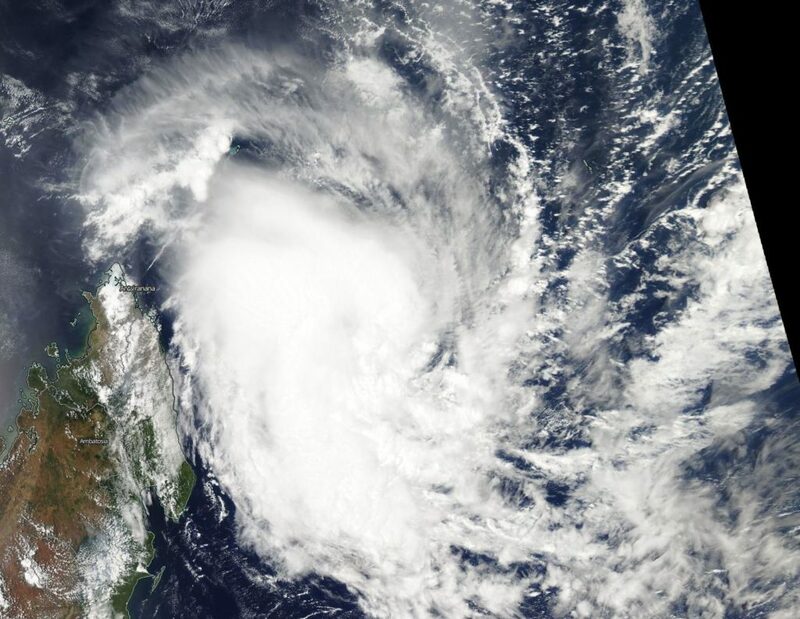 Tropical cyclone Alcide (03S), the first tropical cyclone of the 2018-2019 South-West Indian Ocean tropical cyclone season, has formed in the South Indian Ocean northeast of Madagascar. The Joint Typhoon Warning Center (JTWC) issued its first warning for 03S on Nov. 6, 2018 at 0000 UTC (Nov. 5 at 7 p.m. EST) when the tropical cyclone was located about 1,313 km (709 nautical miles) west of Diego Garcia. This is a little early for a tropical cyclone to develop in that part of the world. The South-West Indian Ocean tropical cyclone season doesn’t officially begin until November 15, 2018. The GPM core observatory satellite had a good view of tropical cyclone Alcide on November 6, 2018 at 11:09 a.m. EST (1609 UTC). At that time Alcide had maximum sustained winds of about 35 knots (40.3 mph). GPM’s Microwave Imager (GMI) and GPM’s Dual-Frequency Precipitation Radar (DPR) instruments collected data that showed the location and intensity of precipitation within Alcide. GPM’s GMI indicated that strong convective storms northwest of Alcide’s center of circulation were dropping rain at a rate of more than 44 mm (1.73 inches) per hour. GPM’s radar (DPR Ku Band) probed Alcide in a swath through the eastern side of the tropical cyclone. Those data revealed the locations of precipitation within feeder bands spiraling into the southeastern side of the intensifying tropical cyclone. 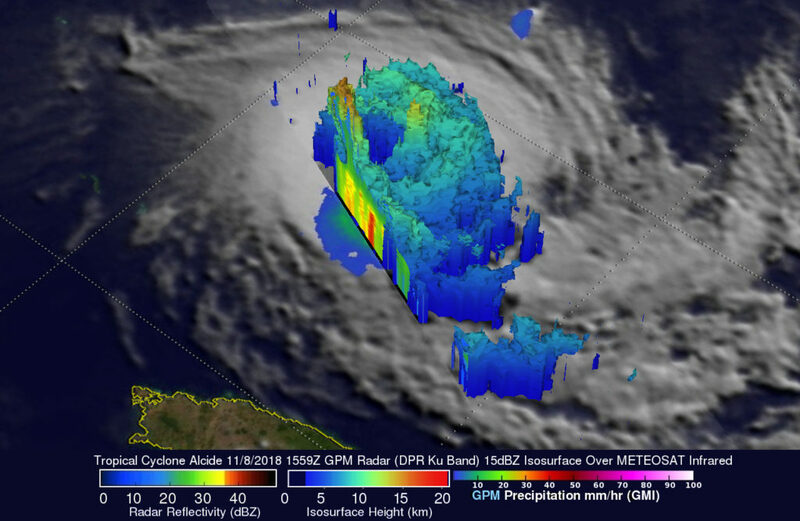 At NASA’s Goddard Space Flight Center in Greenbelt, Maryland, a 3D animation was created from the data that showed a simulated flyby above Tropical Cyclone Alcide. Measurements of the relative heights of precipitation within tropical cyclone Alcide were made possible using GPM’s radar data (DPR Ku Band). DPR’s Ku Band radar enables three dimensional measurements of precipitation within a 152 mile (245 km) wide swath. The heights of precipitation over a larger area were estimated by blending measurements from GPM’s radar (DPR Ku band) with heights based on the Meteosat satellite’s infrared temperatures. GPM is a joint mission between NASA and the Japan Aerospace Exploration Agency, JAXA. On Nov. 8 at 10 a.m. EST (1500 UTC), Alcide had achieved peak wind speed when maximum sustained winds were near 95 knots (110 mph/178 kph). A weakening trend is now expected, according to the JTWC. Alcide was centered near 12.1 degrees south latitude and 53.6 degrees east longitude, about 528 nautical miles north-northwest of Port Louis, Mauritius. Alcide was moving to the southwest. Satellite data on Nov. 8 showed that the eye had become ragged and cloud-filled. The JTWC forecast calls for Alcide to loop. Alcide is expected to remain well northeast of Madagascar. Alcide is then expected to move into an area of increasing vertical wind shear and lower sea surface temperatures causing the tropical cyclone to gradually weaken.